December 6, 2017 -- The job market for radiologists is shifting once again: Job opportunities are on the rise, and employers are having difficulty filling vacancies. Over the past 15 years, Radiology Business Solutions (RBS) has provided radiologist recruiting services for group and hospital management clients nationwide. Through extensive experience in placing radiologists and filling job vacancies, we have monitored the job market and observed the trend firsthand. We'd like to share our observations with you and keep you in-the-know as the radiology job market fluctuates. Daniel Corbett of Radiology Business Solutions. Trends benefiting radiologist candidates have been steadily increasing since 2015. Radiologist recruitment is at an all-time high as practice leaders can no longer fill positions through networking and internet ads. Across the U.S., recruitment companies have experienced an influx of radiologist requests. A demand for locum tenens is also on the rise and daily pay rates for the position have consistently increased. RBS has seen this shift in supply and demand firsthand. In July 2015, RBS placed a job posting on the American College of Radiology (ACR) Career Center website for a client in rural Pennsylvania. At the time, there were 144 jobs posted with 1,260 CVs available for review in the resume bank. Our position posting received 35 online applicants in the first three days with a total of 107 applicants over a 30-day posting period. The position was filled quickly. In May 2017, two years later, RBS placed the same posting for the same client on the ACR Career Center site. There were 510 jobs posted at the time, with only 345 CVs in the resume bank. Our posting generated only eight inquiries by the end of a 30-day run. 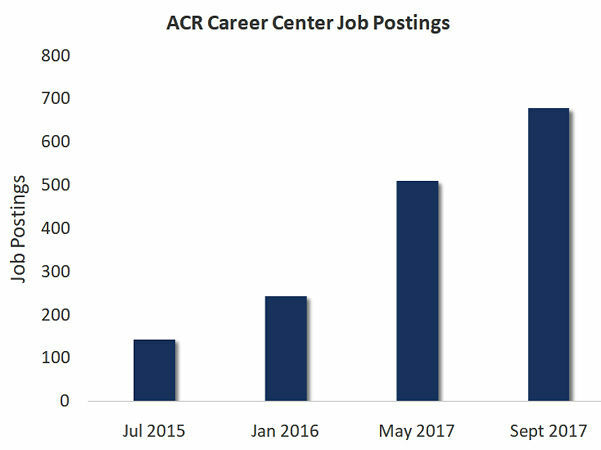 The number of ACR Career Center job postings has continued to increase since then. Image courtesy of Daniel Corbett. RBS has seen similar results throughout the past two years -- the demand for radiologists rises as the supply diminishes. Not surprisingly, our results have been consistent with national statistics. The 2017 ACR Commission on Human Resources workforce survey predicted a positive outlook for radiologists seeking work over the next few years; the commission found a 14.1% increase in radiology jobs in 2017 compared to 2016.1 Job opportunities were at an unprecedented low in 2013, and the recent optimistic trend for job seekers has created a competitive market for employers. Baby boomers are the most obvious demographic of the growing radiology job market, affecting both patient and practitioner. As this sizeable generation ages, their increased medical needs call for more imaging in the already expanding field. Likewise, radiologists of the baby boomer generation are retiring, leaving groups with an inadequate pool of efficient and productive practitioners. The 2017 Medical Marketing Services AMA Master List showed that among the current 29,149 board-certified radiologists practicing in the U.S., 9,880 radiologists are older than 60 and 2,250 are older than 70.2 More than 33% of practicing radiologists are close to or beyond retirement age. In contrast, approximately 1,200 individuals joined the workforce this year. Plainly, radiologists are retiring at a speed that surpasses the number of individuals finishing fellowships. With a growing need for and a declining pool of practicing radiologists, available positions are increasing and competition has heightened for employers. The 2017 ACR workforce survey found that hiring projections will continue to increase over the next year. In both rural and urban practices and throughout radiology subspecialties, employers will be hiring more practitioners among a smaller selection of applicants. The ACR workforce survey determined that its annual one-year projections have been substantially accurate, but its three-year predictions have been consistently lower than the actual hiring rate. The ACR was not able to foresee this drastic increase in job availability, and it predicts an even greater spike in the coming years. This is great news for fellows who will soon be entering the job market, as well as for experienced radiologists looking to make a change -- and less-than-great news for groups losing productive radiologists. Currently, there are 730 jobs posted on the ACR site, and we see no sign of this slowing. RBS estimates that total job postings could reach 900 by the end of 2018. Practices with radiologists nearing retirement should work to solidify time frames for their retirement, allowing the group a full year or more to recruit a quality replacement. Understaffed radiology groups should reconsider their recruiting strategy, partnership track lengths, and starting salaries. Over the hundreds of consulting projects RBS has conducted over the past 15 years, we have consistently seen staffing shortages leading to overworked and stressed radiologists and groups. Perpetual and recurrent understaffing inevitably leads to service and quality issues, resulting in complaints by medical staff and potential risks to the group's hospital contract. With a shortage of radiologists projected for the next few years, radiology groups should prioritize staffing to minimize burnout, maintain service levels, and provide security for the practice. Bluth EI, Bansal S, Bender CE. The 2017 ACR Commission on Human Resources Workforce Survey. J Am Coll Radiol. 2017;14(2):1613-1619. doi:10.1016/j.jacr.2017.06.012. 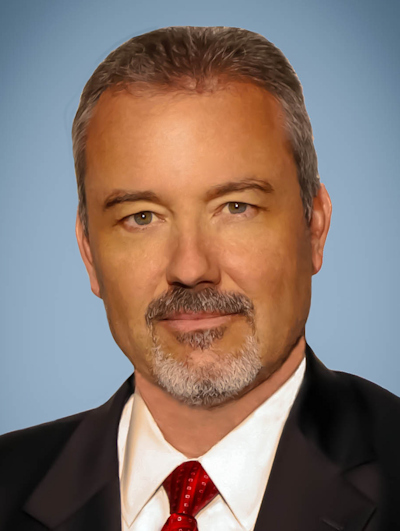 Daniel Corbett is a founder and chief of business development at Radiology Business Solutions, which now offers a concierge-style approach to recruiting radiologists for nonmanagement clients. The firm conducts detailed analyses of both the radiology group and the position it hopes to fill, studying the group's history, leadership, and expectations to differentiate the job opportunity from others. RBS then sets the stage for meaningful and productive interviews that lead to effective hiring. By leveraging accurate information with real relationships within the group, RBS is able to more effectively identify interested candidates and prequalify them for interviews, saving time and costs in a challenging market. The comments and observations expressed herein do not necessarily reflect the opinions of AuntMinnie.com.